SANTA CLARA, California, March 21, 2019 /PRNewswire/ --ColorTokens Inc., a pioneer in workload and endpoint security, today announced that it was named Next Gen Security Company of the Year at the 2019 Cyber Defense Magazine InfoSec Awards. 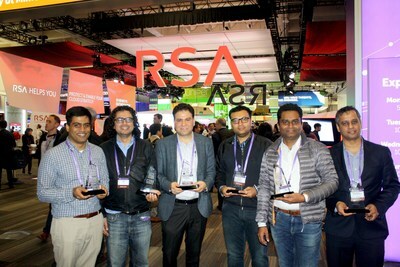 The company also won five other awards, including Most Innovative Micro-segmentation, State of the Art Application Security, Breakout Cloud Security, Hot Company Data Center Security, and Publisher's Choice Endpoint Security awards. ColorTokens was selected for its advanced software-defined approach which combines network and endpoint security with best-in-class visual experience to deliver protection, detection, and response in a single platform. "IT security teams have long realized that addressing only one aspect of security such as protection, detection, investigation, or remediation is not enough. But stitching together all these different approaches required large investments. With the ColorTokens one agent, one platform approach, they are finally able to manage the security needs of their business at a sustainable cost and manageable operational overhead," said Rajesh Khazanchi, Co-Founder and EVP, ColorTokens Inc. "These awards further validate our approach and vision of delivering what customers today desperately need." The Cyber Defense Magazine InfoSec Awards are judged by leading security experts who vote based on their independent review. "ColorTokens has won the Next Gen Security Company of the Year because they are an innovator that can actually help you defeat the next generation of exploiters," said Gary S. Miliefsky, Publisher, Cyber Defense Magazine. Built around a zero-trust architecture, ColorTokens provides a unified and proactive security platform that allows modern enterprises to secure endpoints, data center and cloud workloads from zero-day and advanced persistent threats. ColorTokens Inc., a Silicon Valley company, enables zero-trust security for endpoints and workloads. ColorTokens technology secures workloads, application environments, users and endpoints in traditional and hybrid deployments, against internal and external threats. ColorTokens is platform independent and enables enterprises shift from reactive to a proactive security model, without additional investment in hardware and operational complexities. For more information, visit http://www.colortokens.com and write to media@colortokens.com for enquiries.